Poached Pears and Nutella Pastries - Let the Baking Begin! 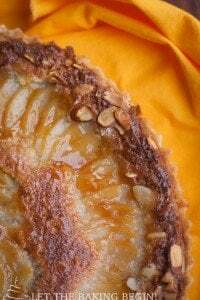 I poach my pears and leave them in the poaching liquid overnight, or better yet for a couple of days – this allows the pears to absorb all the flavors of the Amaretto, vanilla and sugar. Please do not be tempted to use canned pears as the poached pears are the shining star of this dessert and the Poached Pear & Nutella Pastries just wouldn’t be what they intended to be with the canned stuff. Prepare your Poached Pears following the recipe for Poached Pears here. 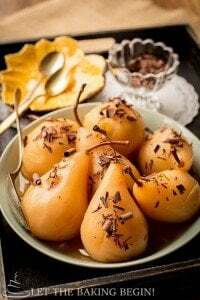 Cut the poached pears in half and remove the seeds from the center with a mellon baller or teaspoon. Now fill the hollowed cavities with Nutella. Place two thawed and unfolded sheets of puff pastry together and gently go over with a rolling pin to adhere the layers together. Poke the sheet with a fork every 1 inch. Invert the filled pears onto the puff pastry sheet filled side down, spacing the pears about ½ an inch apart. Using a pizza cutter or a knife go around the pears leaving about ¼ of an inch of puff pastry around each pear. Remove the scraps. 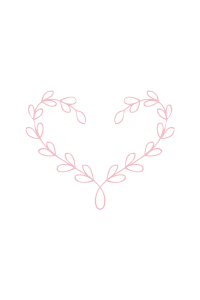 If you want to add leaves to the pastries, use a leaf cookie cutter to cut out the leaf shapes, then using a knife go and make the leaf veins on each cutout leaf. Attach the leaves to the narrow end of the pasties and press firmly to adhere. With a spatula transfer the puff pastries with pears onto a parchment lined baking sheet, spacing them at least ½ an inch apart. Bake in a preheated to 400F degrees oven for about 15 minutes or until the edges of the pastries are golden in color. Then, cover loosely with foil and continue baking until the bottoms are thoroughly baked, about 5 minutes. Heat about 3-4 tablespoons of apricot preserves or jam and put through a fine mesh sieve. Now use a pastry brush and cover the tops of the pastries with the preserves. Fill a ziplock bag with a tablespoon of Nutella, remove all air and close. Microwave for 10 seconds. Snip off the end and cover the pears with a drizzle of Nutella in a zig-zag motion. For best results consume within 1 hour. Pastries can be served warm or cold, depending on preference. Note: If not planning to eat right away, leave the pastries unglazed and without Nutella drizzle until ready to serve, then bake in a 400F oven for 5 minutes and continue with the glaze and Nutella drizzle as described in the steps above. 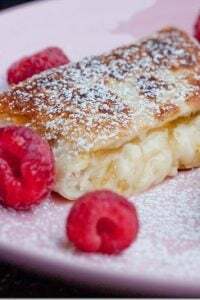 Cheesecake Danish Recipe – Pastry desserts filled with cream cheese and topped with a lemon glaze. 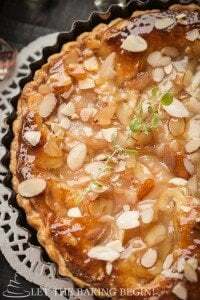 Apricot Almond Pastries – The best puff pastry dessert with apricots. 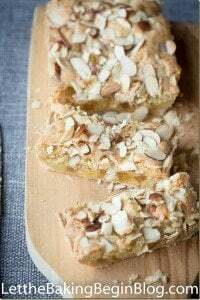 Almond Cream Puff Pastry Braid– Puff pastries with a thick layer of almond filling. If you want to add leaves to the pastries, use a leaf cookie cutter to cut out the leaf shapes, then using a knife go and make the leaf veins. Attach the leaves to the small end of the pasties and press firmly to adhere. Fill a ziplock bag with a tablespoon of Nutella, remove all air and close. Microwave for 10 seconds. Snip off the end and cover the pears with a drizzle of Nutella in a zig-zag motion. For best results consume within 1 hour. Pastries can be served warm or cold, depending on a preference. If not planning to eat right away, leave the pastries unglazed and without Nutella drizzle until ready to serve, then bake in a 400F oven for 5 minutes and continue with the glaze and nutella drizzle as described in the steps above. Apple and Dulce de Leche Pastries Recipe - Let the Baking Begin! Let the Baking Begin! I am used to getting some degree of greatness from you but this just blew my mind! So original, beautiful and intricate! I am so impressed. Gorgeous photos, my friend! You”re so kind Julie! Thank you so much!